Made from 260g 100% polyester lightweight Cool Dryfabric with brush back finish on the inside face, the Stencil Hoodie is a no-fuss classic hooded jacket with elastic cuffs and hem. It features a drawstring hood, a full front zip, zippered pockets on both sides and a small zipped pocket for a mobile phone. Looking to rebrand your business or looking at a new branding avenue for your sporting association? The Stencil Ladies Hoodie is a great option for businesses, sporting clubs, community groups and more. These promotional hoodies are made from 100% lightweight polyester Cool Dry fabric which is perfect for those cooler days sitting besides the sporting fields, going for short hike, or working in the community gardens. 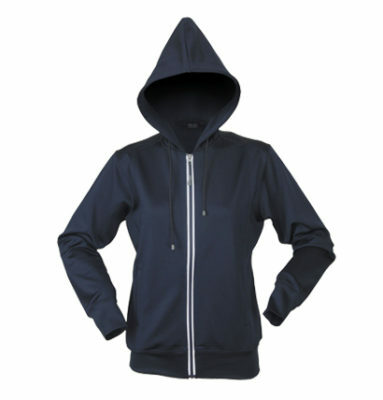 The Stencil Ladies Hoodie is a classic hooded jacket, with a drawstring hood, full front zip, reflective piping on zipper vents, zippered pockets, and a small zipped internal pocket. Available in sizes 8 – 18, the Stencil Hoodie is breathable, easy to care for, and quick drying. These hoodies look great and can be screen printed or embroidered with your logo or branding. Team the Ladies Stencil Hoodie with the men’s for a cohesive branding look through your business, sporting association or community group.